This was found at an old antique shop near the railroad tracks in downtown Ogden, Utah. I don't speak any Spanish and know absolutely nothing about Antonio Eugenio Martinez. All I understood was that little face on the record's label. The music turned out to be exactly what I hoped it would be and I fell in love with it instantly. I even played it while DJing at my friend Tyrone Davies' wedding reception. Beautiful! This boy is a star. Thanks, Blair. "Volver Volver" is "Return, Return" - it's a lost-love song. Ry Cooder and Flaco Jimenez released a version a little matter of 30 years ago. 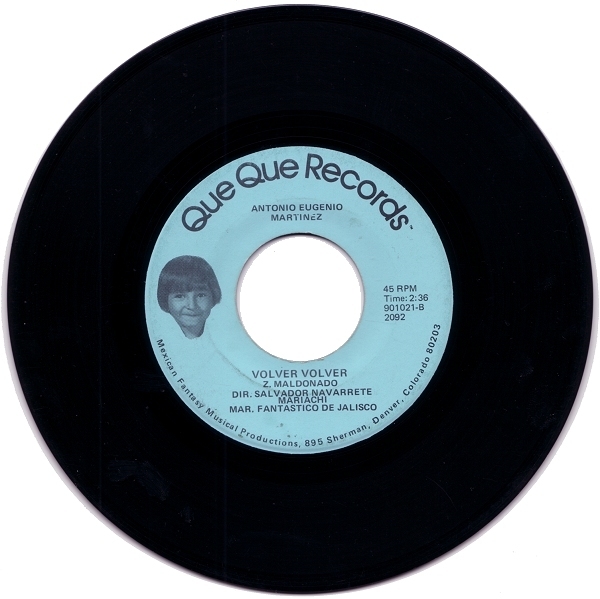 The original version of 'Volver Volver' was released in 1976 by 'El Rey' (the king) of Ranchera, Vicente Fernandez, and is the best by far - although I heard Ry Cooder's version first. This (literally) childish version, however, is a travesty; if young Antonio is 'a star' or 'muy fantastica' then my son is the next Alvin Dahn. 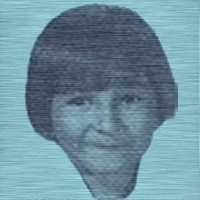 Face it, Antonio is an unremarkable kid who can barely stay in tune. He's not idiosyncratic, moving, evocative or downright strange. And B.C's funky little backstory about coming across this single didn't help - some media should stay lost. Although I visited the original 365 days project many times and many times it came through for me (too often to reference), it also looks as though some of the questionable decisions made there about what constitutes musical 'otherness' are being perpetuated here. 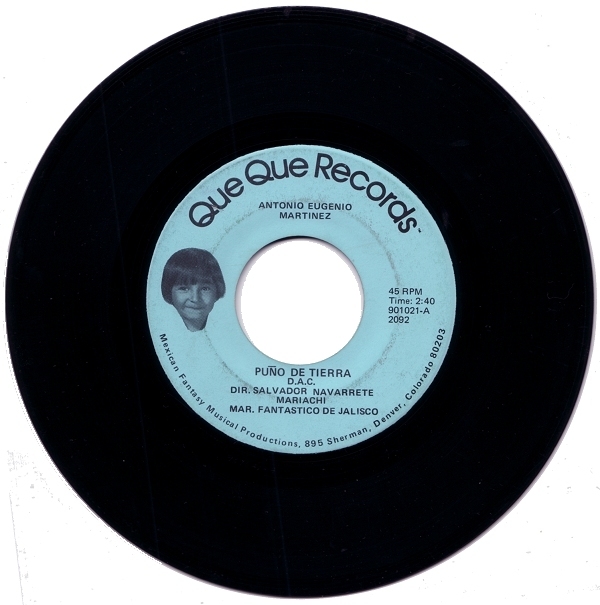 The song Puno de Tierra is still quite popular nowadays, the current version being exquisitely interpreted by Ramon Ayala.